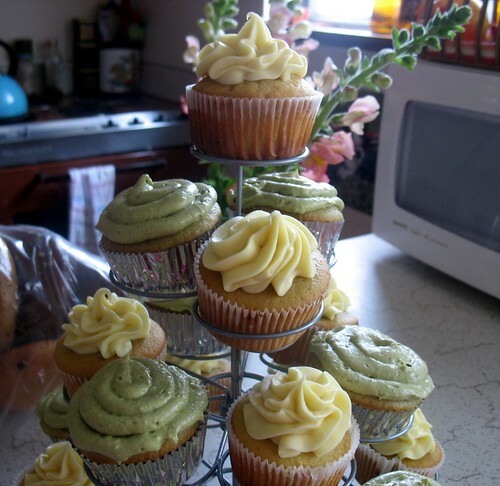 when i made the plan to make the bubble tea cupcakes, it occurred to me that not everyone at the party might be such an adventurous fan of the bubble tea so i wanted make half the cupcakes a more basic flavor, but still exciting and somehow matching the bubble tea theme. i decided to see what i might be able to do with honey because it seemed like the perfect accompaniment for green tea! 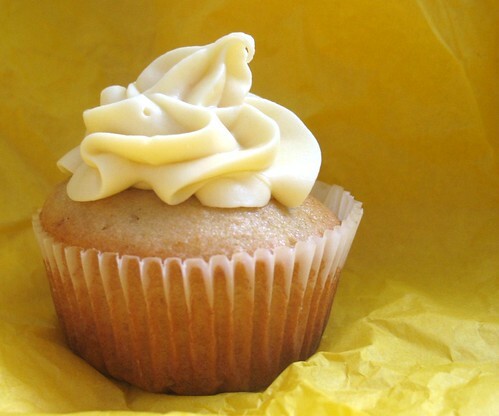 it turns out honey cupcakes are simple and amazing! i don't know why it never occurred to me to do more baking with honey before! the honey just adds a bit of sweetness and flavor that i think worked out wonderfully in cupcake form. next time i might try to up the vanilla flavor with some vanilla bean. this is a really easy cupcake to make, so have no fear even if you don't bake very often! it is certain to impress a crowd! beat butter on high until soft, about 30 seconds. add sugar and honey. Beat on medium-high until light and fluffy, about 3 minutes. add eggs one at a time, beat for 30 seconds between each. whisk together flour, baking powder, and salt in a bowl. Add to mixer bowl. Add the milk and vanilla. mix to combine. scoop into cupcake papers about half to two-thirds full (depending on whether you want flat or domed cupcakes). bake for 22-25 minutes until a knife or toothpick comes out clean. bring cheese and butter to room temperature and beat together until creamy. add honey and continue to mix. add powdered sugar, 1 cup at a time, until desired spreading consistency.